Irish music has held the world in its thrall for hundreds of years, growing and changing with each decade but always keeping that distinctive flavor that identifies it without question. There is some music that will immediately bring to mind Irish stew and a pint of Guinness, and then there are tunes that incorporate pop and rock influences from around the world, retaining very little of the original Irish melodies that are so beloved. It is this transition from traditional Celtic music to the faceless Top 40 sounds that endanger Ireland’s hold on the music world, but there is still hope. 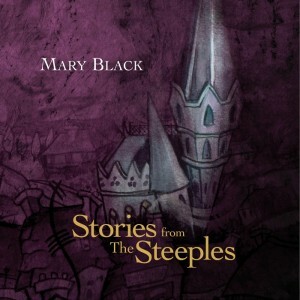 That hope comes in the form of Mary Black with her latest album, Stories from the Steeples. Mary Black is and has been one of the premier voices in Ireland for years and for good reason. Her opening track, Marguerite and the Gambler, is exactly what people have loved about Irish music and folklore for centuries. She tells a story in her distinctive voice and style, clinging to her roots with the tender violin woven through the tune. Mountains to the Sea is a driving tune, featuring Imelda May–an up and coming Irish legend, to be sure. The harmony is sure and strong, and yet the vocals manage to retain an ethereal feel. Again, the grand tradition of storytelling is retained here. On Walking with My Love, Finbar Furey joins Ms. Black, supported by understated banjo. This is a beautiful, simple tune with smooth, restrained vocals that will elicit a few chills. Following this sweet song is the anthem, All the Fine Young Men, which opens with gorgeous piano. The album closes with Fifi the Flea, which was first written and performed by The Hollies. Mary Black does a beautiful job capturing both the sadness and the whimsy, which is just one more thing Irish music has become known for. Though not centuries old, or even decades old, these songs could easily take their places in traditional Irish music. They keep the best of the old while infusing the excitement of the new, and they’ll no doubt become the classics in years to come. You mentioned Imelda May. I saw her here in Atlanta a couple of years ago. She opened for Jeff Beck and just killed it! Crowd loved her.